Not rated. Color. 87 minutes. There is trouble in Paradise. (Sorry, I couldn't resist that!). The body of a teenage girl is discovered on the edge of a lake. Was it suicide or murder? Stone suspects it was murder and sets about to find out who did the crime, and why. But first he has to find out who the victim was. Meanwhile, he's dealing with other local crimes. Jerry Snyder (John Diehl) is having another go at his battered wife (Debra Christofferson) although she claims he didn't hit her and she has the swollen, bloodied face to prove it. I like the slower pace of the Stone movies (at least of the two I've seen so far). It gives the viewer that small town feeling that nothing important ever happens and even if it does, it doesn't happen in any hurry. I also like that there is more going on than just the "big" case. Stone and his officers still have to deal with policing the rest of the town despite having a homicide to investigate. And I also like that the cases don't necessarily ever intertwine. For many films, the various crimes may seem separate with no apparent relationship to each other, but in the end, they all are interrelated in some way. In "Death in Paradise" one event isn't necessarily tied to any other. I like that the screenplay writers have chosen to keep Paradise small. No fancy crime lab, no forensic experts hanging around. No one wants to talk to Stone. The petty criminals don't take him seriously. Neither do the professional criminals. They spend a lot of time running him around in circles. Real life. The bad guys aren't always scared of the cops and they don't confess just because you stare at them. I was thrilled that Stone's three officers Molly Crane, D'Angelo, and Luther 'Suitcase' Simpson (Viola Davis, Vito Rezza, Kohl Sudduth) returned in this outing, as did Captain Healy (Stephen McHattie) of the State Police. I miss Boomer, though. This is not your average made-for-TV movie. The plot, the setting, the cinematography, the music, and the outstanding quality of the actors, both regular and guest stars, combine for a very polished look. It's a pleasure to follow this series. As I mentioned in my review of "Night Passage," I'm not a fan of Tom Selleck but I do think he fits the role of Jesse Stone quite well. I have never read any of Robert B. Parker's works, including his popular Spencer series, but I may have to pick up one or two of the Jesse Stone books next time I'm at the bookstore and see how they compare to the movies. 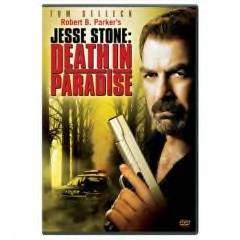 Other movie titles in this series include Stone Cold, Jesse Stone: Night Passage, and Jesse Stone: Sea Change. Not interested in owning a copy? Try renting these DVDs at your local video rental store or a mail-in source like Netflix. You might even be able to check them out from your local library. Copyright © 2008 Over My Dead Body! All rights reserved. Reproduction in whole or in part in any form or medium without express written permission of Over My Dead Body! is prohibited. OMDB! and OMDB! logos are trademarks of Over My Dead Body! Return to Over My Dead Body! Online.